Global autism rates are on the rise and many are beginning to ask questions about how they can best treat or remedy symptoms to increase quality of life overall. 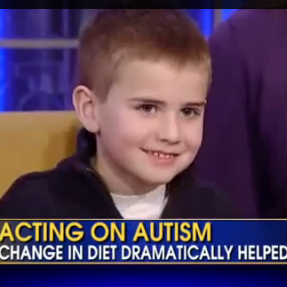 In one particular case, a young boy by the name of Ethan Fox began showing strong signs of Autism recovery when his diet was changed to no longer include gluten and dairy. It is believed that changing an autistic child’s diet to no longer include gluten and dairy can assist 60% of children with autism. The video below covers the story in detail so be sure to check it out for more information on this specific case. There is much concern that the rise in autism is directly linked to the rise in vaccines since the early 1990′s. While this theory has been debunked on several occasions by mainstream health, many independent studies are confirming the link, suggesting that mainstream health has a vested benefit in the continuation of their practices. Many researchers in the field strongly believe the current vaccine schedule is unsafe and health professionals are turning a blind eye to the real and factual results. Many arguments against the mainstream approach to this research is that they have not properly studied or tested the link between autism and vaccines and therefore are irresponsibly drawing conclusions. 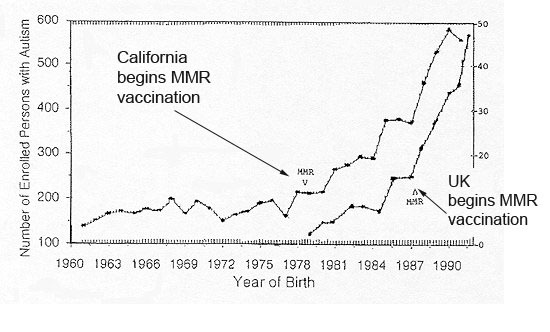 The graph illustrates the link between the MMR vaccine and the rise in autism.